Stamoules Produce Co. began in 1927 with a dream Spero Stamoules had as a young man in Greece. As a young man he immigrated to New York City where he found work at the Waldorf Astoria Hotel as a waiter and collected the cantaloupe seeds with a vision that someday he would farm. Spero followed the first load of his cantaloupes to New York but, while arriving to Grand Central Station, Spero passed away of a heart attack at the age of 54. He was survived by his wife Helen and his thirteen month old daughter, Peggy. During the next thirty five years Helen continued with her husband’s farming dream as a conservative and astute business woman and a single mother with a remarkable sense of humor. 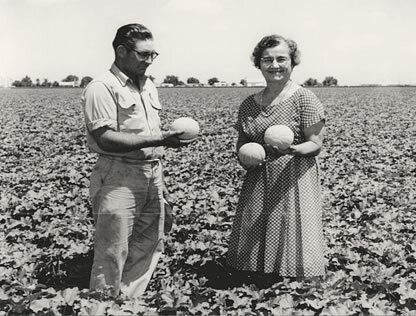 Since the 1960’s, Stamoules Produce had expanded and experimented with not only growing cantaloupes but, honeydews, mini watermelons, bell peppers, sweet corn, broccoli, pistachios, onions and cauliflower. With the exception of the latter two crops they now grow, pack and cool all their own produce within a strategically placed distance from the fields. In 1997, Stamoules built a new cooling facility, eight miles west of Mendota, which would help decrease fuel costs and bring them closer to ‘their business’. Since the last twelve years incremental additions to the cooler have scaled the size to 450,000 square feet of cooling space. Although each product survives at its own ideal temperature [between 32 – 35 degrees], tactically engineered measures have been made to compartmentalize the temperature range. Each crop can then be pre-cooled, cooled and shipped out on a refrigerated truck within a twenty-four hour period. In 1998, drip irrigation was integrated into the Stamoules’ farm for conserving water, uniform distribution of fertilizers and mineral cultivation of the land. 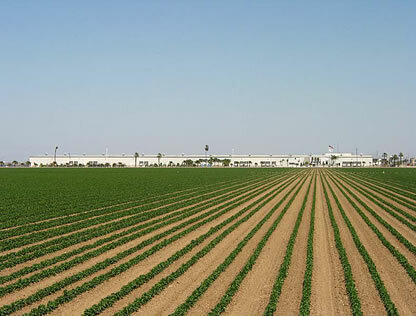 It is now an important part of the approximately 17,000 acres of produce Stamoules grows annually. 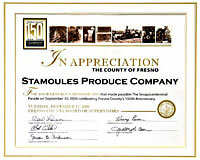 Stamoules Produce Co., Inc. has experienced much in farming over the last 88 years. Efficiency and quality are important business tactics in today's world. We strive to meet and exceed our own strict conditions so that the product you get is the product you enjoy.